Kidney disease is a public health problem that affects more than 20 million people in the US adult population, yet little is understood about the impact of kidney disease on drug disposition. Consequently there is a critical need to be able to model the human kidney and other organ systems, to improve our understanding of drug efficacy, safety, and toxicity, especially during drug development. The kidneys in general, and the proximal tubule specifically, play a central role in the elimination of xenobiotics. With recent advances in molecular investigation, considerable information has been gathered regarding the substrate profiles of the individual transporters expressed in the proximal tubule. However, we have little knowledge of how these transporters coupled with intracellular enzymes and influenced by metabolic pathways form an efficient secretory and reabsorptive mechanism in the renal tubule. Proximal tubular secretion and reabsorption of xenobiotics is critically dependent on interactions with peritubular capillaries and the interstitium. We plan to robustly model the human kidney tubule interstitium, utilizing an ex vivo three-dimensional modular microphysiological system with human kidney-derived cells. The microphysiological system should accurately reflect human physiology, be usable to predict renal handling of xenobiotics, and should assess mechanisms of kidney injury, and the biological response to injury, from endogenous and exogenous intoxicants. Chronic kidney disease (CKD) is a public health problem that affects more than 20 million people in the US adult population . As loss of kidney function progresses to kidney failure, many patients become dependent on hemodialysis, with more than 400,000 patients currently undergoing regular dialysis. An average dialysis patient may require more than 12 medications, exceeding $16,000 per patient per year. A pooled analysis identified 1,593 medication-related problems in 385 dialysis patients, and dosing errors accounted for 20.4% of these problems (11.2% subtherapeutic dosage, 9.2% over-dosage) . Patients with earlier stages of CKD are also at risk of drug complications - in a community setting, 10% of patients with renal insufficiency (serum creatinine >1.5 mg/dl) experienced a drug-related adverse event, with greater than one-half of these events considered serious and 4.5% of the events life-threatening . Despite the large number affected, the costs involved, and the devastating consequences of medication-related problems, little is known about the impact of renal impairment on drug disposition, including those drugs eliminated primarily by hepatic pathways . The development of an ex vivo microphysiological system for understanding the determinants of xenobiotic disposition via modeling kidney cell function in health and disease thus has the potential to dramatically impact on public health. The kidney is a critically important organ when it comes to predictive evaluation of the safety, toxicity, and efficacy of drugs and nondrug chemicals. The recent emphasis on the development of microphysiological models affords an unprecedented opportunity to better predict in vivo renal drug clearance. In vitro-to-in vivo scaling is an important tool in current drug development during transition of a drug candidate from the preclinical phase to phase 1 clinical trials, when targeting a safe first-in-human dose is a key decision. Current practice primarily relies on allometric scaling of in vivo pharmacokinetic data obtained from laboratory animal species; however, interspecies differences in drug absorption and disposition have proven to be a significant obstacle. Currently, a concerted effort is made to derive pharmacokinetic parameters based on in vitro data obtained from cultured human tissue or cell systems. Unfortunately, conventional cell culture fails to capture the multicellular complexity and three-dimensional (3D) architecture of physiological systems. This is certainly the case with prediction of renal drug clearance in humans. The two terms in square brackets represent filtration clearance, equivalent to the glomerular filtration rate of the drug in units of flow (conventionally milliliters per minute) and secretory clearance (also in flow units). Both terms may be modified by the unbound fraction of drug in blood or plasma since glomerular filtration and uptake at the basolateral membrane of the epithelium are restricted to freely diffusible drug. The glomerular filtration rate is readily measurable and can be simply and accurately estimated in both healthy and kidney disease populations using commonly available laboratory tests such as the serum creatinine concentration. Reabsorption of the filtered load along the entire length of the renal tubule is also predictable for most drugs or xenobiotics, as it is a function of water reabsorption and solute passive diffusion. Parallel tube flow models have successfully described the tubular reabsorption of a number of neutral or poorly ionizable endogenous substances (for example, creatinine, urea) and drugs (for example, ethanol, butabarbital, chloramphenicol, and theophylline). These models require only known physiological and physicochemical parameters for prediction; namely, relevant dimensions of renal tubules (such as length, outer diameter, and outer surface area) and the solute permeability across the tubular epithelium. The latter can be measured in vitro with monolayer culture of renal epithelial cells. The same approach is applicable to ionizable organic solutes. The only exception that cannot be accommodated by this relatively straightforward physical model is the presence of active, carrier-mediated reabsorption, which is rare with exogenous organic solutes. At present, the one critical parameter not amenable to in vitro-to-in vivo scaling is proximal tubular secretion. The foremost difficulty is in obtaining a meaningful measure of secretory transport in vitro with existing renal epithelial cell cultures. Epithelial cell lines of animal or human kidney origin have proven suboptimal as in vivo models because of their transformed characteristics, loss of kidney tubule-specific transporters, and changes in metabolism [5–7]. Freshly isolated or cryogenically preserved human renal tubular cells in culture may be an improved option for replicating in vivo function option at present. Unfortunately, much work remains in improving their tight junctional integrity and recapitulation of normal transport functions. More importantly, these unidimensional cultures provide measurement of transport permeability, but fail to yield the critical parameter - the permeability-area product, which takes into account the lateral surface area of the tubular epithelium in an intact nephron . As a result, the permeability measurements from conventional epithelial cell culture studies can only provide rank-order comparison between drug substrates and are of limited use for in vitro-to-in vivo scaling. Another serious drawback with the conventional single-cell type cultures is the absence of interactions between kidney cell types and structures, particularly since the vasculature is critical for drug and xenobiotic secretion. As a result, it is not feasible to explore the full impact of toxic insult and disease on tubular secretion. Until recently, the microvasculature of the kidney has received relatively little attention, particularly regarding in vitro culture systems. This lack is in part due to the fact that it has been difficult to visualize and in part due to the difficulty in studying endothelial cells and their supporting cells, the pericytes. However, studies over the last 10 years have shown that: the kidney peritubular capillaries are very susceptible to rarefaction after injury; successful kidney regeneration requires successful angiogenesis after injury; and rarefaction of capillaries leads to tissue ischemia, which drives inflammation and further kidney damage, culminating in the syndrome of CKD. The microvasculature defines the physiological and structural characteristics of the microenvironment and is key to the initiation and progression of disease states, including vascular angiopathy, fibrosis, ischemic kidney injury, and CKD [9–11]. Recent work by our group and others has established that, within the kidney, pericytes are abundant, and serve critical roles in angiogenesis, microvascular stability, microvascular permeability, flow, and regulation of tubular sodium reabsorption. In response to injury, pericytes have now been shown by state-of-the-art genetic fate mapping methods and other methods to be the primary source of scar-forming myofibroblasts. The resultant fibrosis destroys and distorts kidney architecture, and interferes with normal tubular function. Recent data also suggest that the epithelium can signal directly to pericytes to stimulate activation, detachment, and migration into the interstitial space. 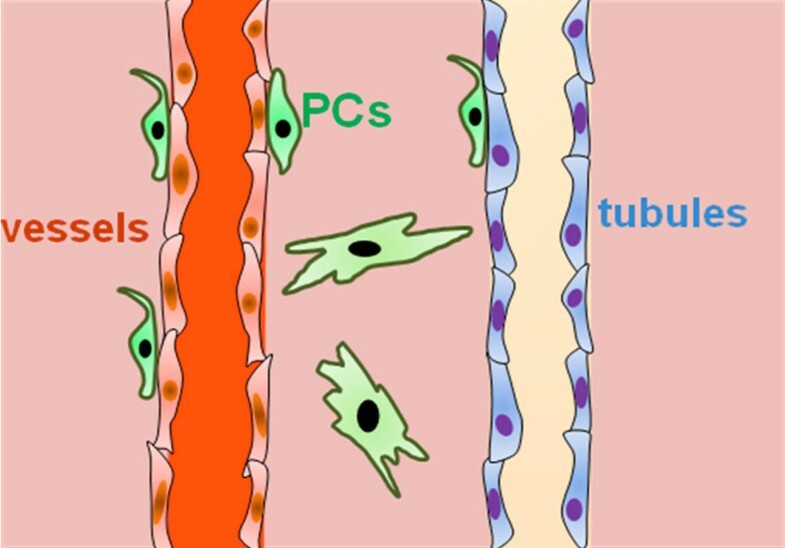 Conventional planar cultures of endothelial cells or cocultures of endothelial cells with pericytes fail to recapitulate the in vivo 3D architecture of the microvasculature (lumens and axial branching points), as well as the interactions of perivascular and endothelial cells with extracellular tissue and associated blood flow . Ex vivo cultures that produce tubular vessels within 3D matrices and systems that incorporate pericytes will allow one to address the functional roles that the microvasculature plays in both normal physiology and disease. Significant progress has recently been made towards creating biologically derived or synthetic materials for generating macrovessel tubes  and endothelialized microtubes . In addition, complex 3D micro-fabricated geometries engineered on a micro-scale in hydrogels , random microvasculature generation via cellular self-assembly , and co-distribution of growth factors with cells in 3D matrices  have all contributed to advancements in microphysiological system generation. As depicted in Figure 1, we propose to reconstruct the in vivo environment of the kidney with 3D co-cultures of the three critical cell types to facilitate ex vivo modeling of normal kidney function, as well as response to uremic toxins. The device for this microphysiological system generation incorporates cells in a 3D, gas-permeable hydrogel (Figure 2a) . Depending on the cell type, the device can incorporate cells throughout the chamber matrix (for example, pericytes) or they may be restricted within discrete tubular structures (for example, endothelial and epithelial cells). Flow within a device may be directed through the tubular chambers or via engineered side ports. An example of a successfully constructed device is shown in Figure 2b, depicting primary human renal epithelial cells forming a confluent tube of cells within a flowing chamber at 2 weeks post cell injection. The achievement of a metabolically function ex vivo mixed-cell kidney device is the first step, with the ultimate goal of integrating microphysiological system generation devices incorporating multiple organs in appropriate series. Critical cell types in the in vivo environment of the kidney. 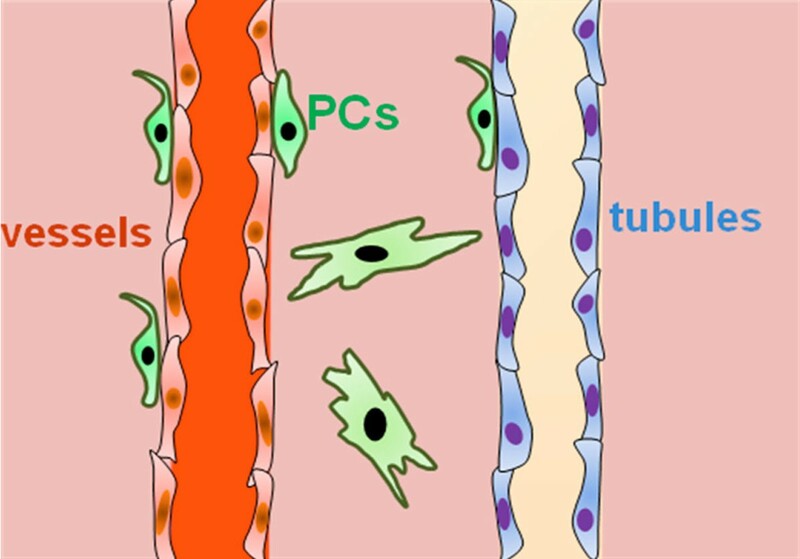 Cartoon depiction of the spatial relationship of renal tubule epithelial cells, vessel endothelial cells and pericyte cells (PCs). Device for microphysiological system generation of the in vivo environment of the kidney. 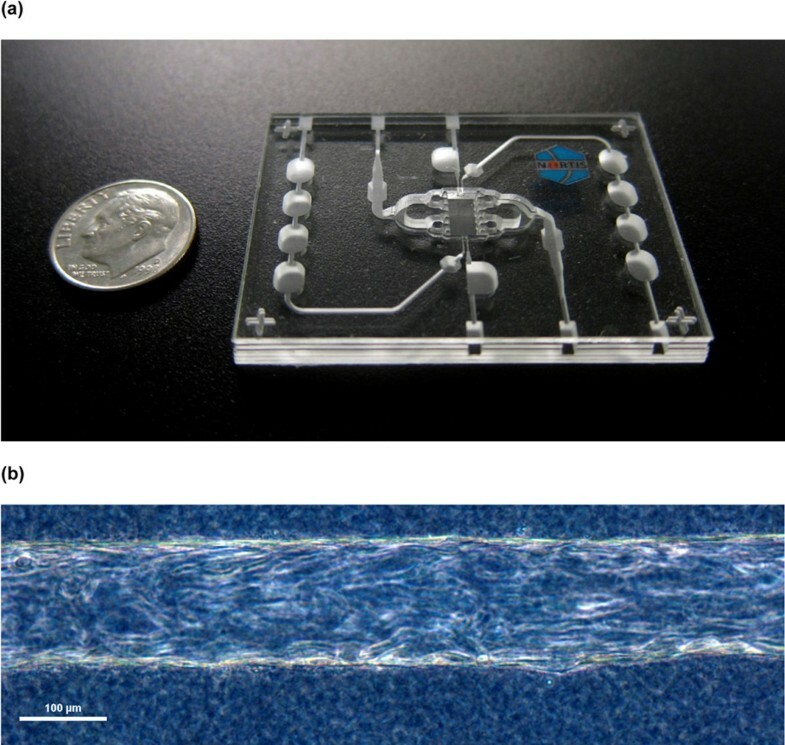 (a) Dual-channel Nortis microphysiological device for ex vivo modeling of kidney function. (b) Culture of primary human renal epithelial cells in the Nortis device 14 days post seeding. Bar = 100 μM. Support was provided for this work in part from National Institutes of Health grant 1UH2TR000504 (to JH), the Drug Metabolism Transport and Pharmacogenetics Research Fund in the School of Pharmacy, University of Washington (to EJK), KL2 TR000421 (to CKY), and ES007033 (to DLE). Funds for the publication of this article were provided by National Institutes of Health grant 1UH2TR000504 (to JH).